National daily Republica´s Birgunj correspondent Upendra Lamichhane has been attacked at Simara Chowk of Bara Monday afternoon. Lamichhane was caught off guard when one Arjun Baidya of Simara-3, Narabasti came on a motorcycle at 4:30 in the afternoon and suddenly started punching him while he was chatting with fellow media persons in front of a shop. “He suddenly attacked me shouting ´you´re the one´,” Lamichhane said. 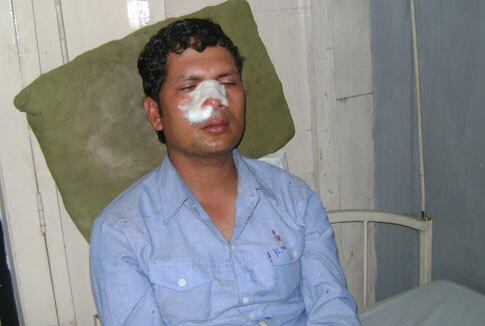 Lamichhane has sustained injuries to his head and nose. He was first treated at local Sanjivan Hospital before being taken to the National Hospital in Birgunj. Inspector at the Area Police Office, Simara KP Sharma said Baidya was apprehended immediately after the incident. Baidya who is in the custody of the Simara Police, has claimed that he attacked Lamichhane over a minor dispute around a couple of months ago. “We have taken the incident seriously and are investigating whether Baidya attacked Lamichhane because of personal animosity or under somebody´s instruction,” inspector Sharma said. The x-ray of his nose at National Hospital showed that Lamichhane has suffered a fracture. “Doctors have said that they would begin the treatment of my fractured nose after swelling recedes,” Lamichhane said. Meanwhile, Republica chapter of the Federation of Nepali Journalists (FNJ) has condemned the attack and demanded that the concerned authorities probe the incident and take stringent action against the assailants. The Bara chapter of the FNJ and Freedom Watch Nepal have also denounced the incident.